It was quiet on the way there (half empty Jubilee Line carriage), but then again it was early Sunday morning and all lines were running smoothly. The only minor hitch was a slight delay approaching West Ham and Stratford due to congestion on the line ahead. The return trip was much busier, but we still had seats. I expect week days will be more crowded, but for anyone with experience as a London commuter, today’s journey was about as trouble-free as it ever gets. Stratford station was very busy on arrival, but the stewards were efficient at directing the crowds. Entry into the Olympic Park itself was quick and easy, there weren’t any queues at the gates. On the way home there was a long queue of pushchairs waiting for the lifts from Westfield Stratford City down to Stratford station – to save time you might be better with a sling, or carrying your pushchair down the stairs if you can manage it. Alternatively, West Ham station is expected to be quieter – you can walk from there and enter the Olympic Park by an alternative gate if you want to avoid the Stratford crowds. The Olympic Park covers a huge area and simply walking around it takes quite a long time. 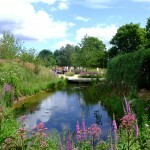 There are some beautifully planted gardens and quiet waterside walkways to meander along if the weather suits. 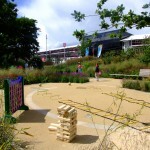 The Great British Garden also has giant Connect 4, Jenga, face painting and children’s sports challenges. The Park Live area has a large screen and plenty of lawn space on which to sit and watch the action (perfect for experiencing the amazing level of support for Team GB). Elsewhere, take in the impressive architecture of the different sporting venues; decide whether you love or hate Anish Kapoor’s Orbit sculpture; and visit the sponsors’ pavilions for games, live action screens and other Games-themed experiences. There seemed to be long queues for all of the sponsors’ attractions throughout the day. 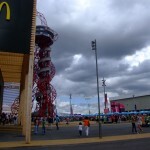 There are also four London 2012 stores on site if you want to buy souvenirs or equipment for supporting your team. 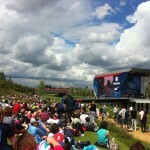 The main problem with the Olympic Park is that there is very little shelter if it rains. We were lucky to enjoy sunny spells for much of the day, but there were three very heavy showers during which we got drenched despite taking waterproofs as we couldn’t find anywhere to take cover. 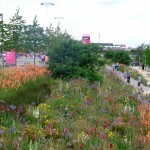 I don’t think that I’d have enjoyed my Olympic Park experience very much if the weather had been poor all day. 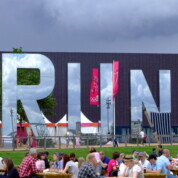 You can bring your own small packed lunch to the Olympic Park, which is advisable if you want to avoid spending all your money at the refreshment stands. That said, a wide choice of food and drink is available from the, now infamous, largest McDonalds in the world, to a host of international cuisines. Hot food ranges in price from approximately £5-10. A cappuccino or soft drink is approximately £2.50, alcoholic drinks start at about £4.30. There is drinking water available, so take empty water bottles to fill up on site. There are picnic tables for eating your own food or food purchased on site. Apart from McDonalds, none of the food outlets has indoor seating and there is almost no shelter if it rains heavily. The Olympic Park is accessible and we were helpfully ushered through the worst of the crowd congestion as a result of the pushchair, for which I was very grateful. There were plenty of loos on site, although they varied in cleanliness across the park. We really ran into difficulty, however, when I tried to change my son. Having searched in vain for baby changing facilities in one of the food and drink areas of the park, I was told that there were rooms set aside for baby changing but that the changing tables “have not been delivered”. A member of staff suggested changing my son in one of the medical stations if no patients were being treated, but on reflection it was easier to change him al fresco in a quiet corner of the park. Nonetheless, I was pretty shocked that the facilities for babies were so poor, as most other things seem to be quite well organised. An experience not to be missed, but expect crowds, queues and to get very wet if the weather’s bad! The overall atmosphere is fantastic and the highlight of the day was watching Team GB win silver in the women’s cycling road race on the Olympic Park’s equivalent of Wimbledon’s Murray Mount. 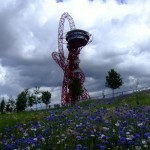 Have you been to the Olympic Park yet? If so, what are your thoughts and do you have any tips for visiting with a baby?